The process of creating this blog has been an interesting but tiring process. I encountered a lot of very engaging information during my research and enjoyed digging deeper to find out more about certain ideas, some of which were very familiar to me already, other concepts I discovered with curiosity. The main obstacle to the undertaking of my work has been that I have had a job to attend to every evening of the week, from 6pm to 10.30pm, and every Wednesday and Saturday afternoon as well. I have been working at the London Palladium theatre for a long time and I am still working there to this day. I plan to leave that job soon, as I am finding it hard to cope, both physically and mentally. The only times I have been able to work on the blog have been at night, after work, and on sundays. The second problem I have faced has been the lack of an internet connection in my house. I have therefore had to do my online research and the publishing of my blog entries only when I have had spare time on campus, using the university’s wireless connection. These two obstacles are thus linked to a problem of time management. Having put myself in this situation, I have just had to deal with the complications and do my best with the time I had and the tools at hand. When I first started the research, using Google, I came across a number of website reviewing the scandal and analysing the ethicality of Walski’s actions. Due to the little time I have had online at a time, I have regularly saved webpages on my laptop hard drive, to then look into them more in detail at a later stage. So I compiled as much information about the subject as I could and then analysed it later in the evening. As my entries started to take shape (first writing them only in my word processing software) so did my train of thought. I began to visualise a pattern to my research and to my future entries. I had a rough idea of the topics to be discussed; I wrote down a list of potential entries and tried to give them a coherent order. I like being organised and knowing the approximate direction in which I am heading. Should I instead have tackled the entries as they came? Even though, most of my research findings seemed to point in that same direction I was aiming for, more or less. All along, my research had evolved into a collection of webpages and newspaper articles, out of which I selected the most relevant ones to keep in a separate folder on my computer. These would be at that point my main sources. When I had dealt with the initial topics that the subject brought up (the picture itself, the photographer, the event, the reactions, etc…), I continued my research by looking deeper into the sociological and theoretical aspects of the subject matter. The concept of ethics seemed to be a key element. Although I had already gathered a certain amount of research on the topic, I found more relevance in the Learning Resource Center (University Library), as I found some interesting books. I borrowed a few titles that later became, for certain entries, my main sources of information. At this point my blog outline plan had changed alongside the evolution of my research. I can in fact say that many of my blog entries developed into something quite different from what I had originally pictured. Unfortunately, just as I was getting into the ‘juicy bits’, the most interesting parts of my research and analysis, I was slowly running out of time. The most demanding issues, the ones that required the most attention, gave me the feeling that I was getting pressured for time. Indeed, I realised that I had more to discuss, more to delve into, partly because the ideas dealt with were more intricate but mainly because they interested me more. I had started to explore truthfulness and objectivity within photography and journalism, as well as the historical and sociopolitical context of the scandal. As my research findings got clearer, so did my panic and the realisation that the deadline was approaching quickly. The last couple of days were mostly spent completing my last few research entries, as well as exploring the possible ideas for an I-Map. My work always ends up being centered around pressure and last-minute panic. But that seems to be what works for me, although it gets extremely tiring. I noticed that my last three entries became much longer than any other blog entries I had made, partly because I had found more interesting information to discuss. Due to the nearness of the deadline, I had to stay up late at night to finish my entries. The exhaustion and lack of sleep definitely affected my ability to think clearly, and I found it very difficult to keep my findings and ideas concise. I hope it will not show too much in the final product. The bibliography didn’t pose too much of a problem since I had written down my references in each entry as I went along. I just had to group them together under alphabetical order. I enjoyed certain aspects of the research and the writing process, but my appreciation was finally taken over by stress and tiredness as the days went on and the deadline approached. The main lessons I have learned from this are to not work in a full-time job during an assignment (!) and to try to get more work done in the earlier stages, which I seem to have a big difficulty with. All in all I feel that I have learned a great deal about modern photojournalism and its relation to current affairs, despite putting myself in very stressful conditions. P.S. : I am adding the following as a last minute comment just before posting my work. The writing plan was my biggest problem: I was too busy with the rest that I didn’t consider the amount of work to put into the writing plan. As I have been working all day at my job and I have thus not had much time to finish my blog. I expected the writing plan to be simple, but when I looked into it and read about in the module guide, I realised there was more work and substance to be put in than I had expected. Therefore, my writing plan ended up being extremely rushed (as well as these few lines) half an hour before the deadline. I am cutting it very short and it makes me sad and angry (with myself) that I didn’t manage to complete it earlier. I apologise for the poor quality of the writing plan. In 2003, in the early stages of the Iraq war, the L.A. Times published a composite photograph created by photographer Brian Walski. After realising that the picture had been altered, the newspaper’s editors dismissed Walski. Did Walski deserve to be fired? Was his dismissal a question of ethics for the newspaper? Does this incident put into doubt the concept of ‘seeing is believing’? We will firstly look into the idea that Walski acted unethically and secondly we will consider the idea that the newspaper reacted wrongly. Brian Walski did not alter the actual message of the picture by creating a composite. This can therefore not be considered unethical. The newspaper used the photographer as a scapegoat to cover up for the fact that they only present a specific biased and misleading aspect of reality. Editor’s Note (1 April 2003). Los Angeles Times [online] Available from: <http://www.sree.net/teaching/lateditors.html> [Accessed on 22 October 2009]. Gelzinis, Peter (2003). WAR IN IRAQ; Trying to understand a former colleague’s lapse in judgment. Boston Herald, 3 April. [online] Boston Herald Library, Provided by ProQuest Information and Learning. Available from: <http://global.factiva.com/aa/?ref=bhld000020030404dz4300023&pp=1&fcpil=en&napc=p&sa_from=> [Accessed on 2 November 2009]. Hartford Courant [Front Page] (2003). 31st March, p.1. [online] Available from: <http://www.poynter.org/resource/28082/HartfordCourant.pdf> [Accessed on 30 October 2003]. Hartford Courant (2003). Editor’s Note: Altered Photograph, 2 April, p. 5. [online] Available from: <http://www.poynter.org/resource/28082/HartfordCourantcorrection.pdf> [Accessed on 30 October 2009]. Irby, Kenneth (2 April 2003 at 12:00 am). L.A. Times Photographer Fired Over Altered Image. [online] Poynter Online. Poynter Center for the Study of Ethics and American Institutions. Available from: <http://www.poynter.org/content/content_view.asp?id=28082> [Accessed on 28 October 2009]. Magnier, Mark (2003). Panic and Human Shields in Basra (front page only). Los Angeles Times, 31st March, p. 1. [online] Available from: <http://www.poynter.org/resource/28082/LATimes.pdf> [Accessed on 30 October 2009]. Meyer, Pedro (2003). The LA Times fires a photographer. [online] ZoneZero. Available from: <http://zonezero.com/magazine/articles/altered/altered.html> [Accessed on 26 October 2009]. Meyer, Pedro (October 2003). In defense of photographer Patrick Schneider and the fictions of a “Code of Ethics”. [online] ZoneZero. Available from: <http://www.zonezero.com/editorial/octubre03/october.html> [Accessed on 26 October 2009]. New Oxford American Dictionary (2005-2009). Version 2.1 (80). [electronic] Mac OS X, Apple Inc. [Accessed on 8 November 2009]. Newton, Julianne Hickerson (2001). The Burden of Visual Truth: The Role of Photojournalism in Mediating Reality, p. 5, p. 8, p. 45, p. 78, p. 79, p. 80, p. 90, p. 102, p. 177, p. 178, p. 184, p. 185. New Jersey: Lawrence Erlbaum Associates. [Accessed on 3 November 2009]. NPPA (2009). History. [online] National Press Photographers Association. Available from: <http://www.nppa.org/about_us/history/> [Accessed on 30th October 2009]. NPPA (2009). Mission Statement. [online] National Press Photographers Association. Available from: <http://www.nppa.org/about_us/> [Accessed on 30th October 2009]. NPPA (2009). NPPA Code of Ethics. [online] National Press Photographers Association. Available from: <http://www.nppa.org/professional_development/business_practices/ethics.html> [Accessed on 30th October 2009]. Office of the Press Secretary, The White House (2003) President Bush Meets with Prime Minister Blair, Remarks by the President and British Prime Minister Tony Blair, The White House, The Cross Hall, 31 January 2003. [online] Available from: <http://georgewbush-whitehouse.archives.gov/news/releases/2003/03/20030322.html> [Accessed on 1 November 2009]. O’Shaughnessy, Nicholas Jackson (2004). Politics and propaganda, weapons of mass seduction, p. 52, p. 53, p. 93, p. 113, p. 133, p. 210, p. 211, p. 212, p. 213, p. 222, p. 225, p. 226. Great Britain: Manchester University Press. [Accessed on 6 November 2009]. Powell, Bonnie Azab (15 March 2004). Reporters, commentators visit Berkeley to conduct in-depth postmortem of Iraq war coverage. [online] UC Berkeley, NewsCenter. Available from: <http://www.berkeley.edu/news/media/releases/2004/03/15_mediatwar.shtml> [Accessed on 1 November 2009]. Singal, Jesse; Lim, Christine; and Stephey, M.J. (2009). Six Years In Iraq, March 2003, Shock And Awe. [online] Time Inc. Available from: <http://www.time.com/time/2007/iraq/1.html> [Accessed on 26 October 2009]. Sontag, Susan (1979). On Photography, p. 168, p. 169, p. 192, p. 206. England: Penguin Books. [Accessed on 5 November 2009]. Van Riper, Frank (9 April 2003). Manipulating Truth, Losing Credibility. [online] Washington Post. Available from: <http://www.washingtonpost.com/wp-srv/photo/essays/vanRiper/030409.htm> [Accessed on 22 October 2009]. Walker, David (7 May 2003). Brian Walski Discusses his Doctored Photo, Photo District News. [online] AllBusiness.com, Inc. Available from: <http://www.allbusiness.com/retail-trade/miscellaneous-retail-retail-stores-not/4450879-1.html> [Accessed on 28 October 2009]. Wikipedia (last modified on 9 February 2009 at 18:30). Brian Walski. [online] Wikimedia Foundation Inc. Available from: <http://en.wikipedia.org/wiki/Brian_Walski> [Accessed 22 October 2009]. Zuppa, Chris (2009). Looking at the truth of a photo, St. Petersburg Times, 11 October. [online] Available from: <http://www.tampabay.com/news/perspective/article1042642.ece> [Accessed on 31 October 2009]. Photographer Brian Walski was working in Iraq on behalf of the Los Angeles Times, in the early stages of the war. He was a respectable photographer who had previously won the Photographer of the Year 2001 award. During his coverage of the war he was working under extremely stressful and tiring conditions, not sleeping for 36 hours according to his friends Don Bartletti. Walski was located in the outskirts of the southern city of Basra, by Al Zubayr bridge, where civilians were gathering in hope of fleeing the tumultuous city. A skirmish had broken out between Iraqi soldiers and the British, who were manning the bridge checkpoint. Following the incident, the photographer decided to compose a picture out of two separate photographs taken earlier, and send it to his editors for publication. The picture just showed a British soldier shouting and motioning for the Iraqi civilians to take cover as the position had come under fire. No direct violence was however visible on the photograph and the people looked reasonably calm. After it got published on the newspaper’s front page, as well as on the front page of the Hartford Courant, the picture’s alteration was discovered. Walski was accused of unethical behaviour and got dismissed from the paper. When asked to justify his actions, he answered with honesty that he was just after a better picture. He did not try to give any excuses. Some people hypothesized that the tough circumstances made him do it, as he wasn’t thinking clearly. Walski said he knew what he was doing, but was not thinking of the consequences. Many journalists and photographers seemed sympathetic towards his situation but denounced his actions, claiming that the incident would undermine photojournalists’ credibility. This led us to question what that credibility is based on and whether that is in fact the real issue on hand. Following Walski’s dismissal, the newspapers published an editor’s note containing the original photographs, a brief exposition of the incident and their ethical stance on the matter. We came to understand that, in fact, the message Walski’s picture was conveying had not been altered, even though the picture itself had. The editors therefore seemed to use the photographer as a scapegoat in order to attempt to proclaim their own questioned truthfulness. The real issue is not in regard to the photographer’s modus operandi, but to the inexistent objectivity and the corruption that lies within the ‘news industry’. News are produced and sold in a true capitalist fashion, in a way comparable to Hollywood cinema. It is about getting as many viewers/readers as possible, using blaring headlines and effective images, no matter what ‘reality’ is being portrayed. In fact, the reality that is shown has very little to do with the overall truth, and is generally put forward for the ideological benefit of the powers that be. We are victims of modern insidious propaganda. The Iraq war was a haven for such activity, first with the arguments for the invasion and then with the constant disinformation and apologia for the military’s deeds. Embedded journalism was the pinnacle of governments’ influence on media: it destroyed any form of objectivity. Although Brian Walski’s picture did not arise from embedded journalism, it was created in the context of a highly criticised and controversial war. Photographs give us a simplified and superficial view of what is happening. The viewer looks at a portrayed event from a different perspective than the image maker, or even than the individuals directly involved. Since the viewer does not directly ‘experience’ the event and only sees a certain frame of the bigger picture, a photograph can never present the complete truth of a situation. With the advancement of photographic technology and the increasingly deceitful and fraudulent media, photojournalism’s credibility seems to wane. The generally accepted ‘code of ethics’ does not invariably apply and the truth of a situation is rarely faithfully rendered. Ultimately, Brian Walski was dismissed for doing his job and caring too much, he worked hard and simply tried to come up with a better picture. He did not change the message of the original photographs, and that is something we have to take into consideration. This applies to any moment we analyse a photojournalistic work; we have to ask ourselves: what is the message of this photograph? Does it reveal anything about the true context? “People act and are photographed. Societal institutions seek to control content of images. Audiences view, absorb, act, reject, and ignore. We have a continuous link between ‘observer’ and ‘observed’; the connection, however, changes drastically from the first stage to the last. The view that the photographer has of a specific subject/event is bound to be immensely different from the perception the final audience has of the photographically portrayed scene. The viewer is “a spectator twice over, spectator of events already shaped, first by the participants and second by the image maker” (Sontag, 1979; p. 169). As we have noticed, depending on the circumstances, the events can also be shaped by the editors and other institutions. Does the message stay the same? When a photograph is published in a newspaper, the connection this time between the ‘signifier’ and the ‘signified’ becomes shaped by the publishing context. A photograph, as we have seen, is generally accompanied by a headline, a caption and an article. There is a mix of words and images organised in a given format. Julianne H. Newton puts forward Wilson Hicks’ idea that, applied to visual reportage, “the whole is greater than the sum of its parts” (Newton, 2001; p. 177). Words are in our minds linked to sounds, and images are composed of “shapes and tones that [to us] represent animate and inanimate entities” (Ibid.). When words and images are combined in certain patterns, they make sense to the human mind and we see them “in relation to one another – as parts forming the pattern of a whole page with one and many meanings” (Ibid; p. 178). An image stimulates specific reactions and thoughts, and text tries to clarify those ideas. But each individual will have a distinct understanding of a visual element. In this mixture of symbols and meanings, can the complete truth of the event be faithfully presented? Photojournalism is all about context: when a picture is published, it is in a way taken out of context. The text in the newspaper is there to contextualise the image. As we have previously seen, the original message can therefore be easily distorted. If we look at a picture by itself, we can presume that we can have a more direct reaction to the event portrayed. However, what we see is only a certain aspect of the subject/event. If photographs usually attempt to create an authentic visual record, they often generate “complete visual deception” (Ibid; p. 45). The audience can be misled because a picture shows an event from one specific angle or point of view, and the image is subject to individual interpretation, as Newton explains. It is impossible to get a grasp of the full picture since we are only shown a portion of reality. As John Szarkowski points out: “Photography is a system of visual editing. At bottom, it is a matter of surrounding with a frame a portion of one’s cone of vision” (Sontag, 1979; p. 192). Brian Walski’s picture for example shows us a very specific scene, and has in fact little to do with what was really happening in Iraq and the bigger issues concerning the war. We can also mention Kafka’s comment that “this automatic camera doesn’t multiply men’s eyes but only gives a fantastically simplified fly eye’s view” (Ibid; p. 206). He argues that we cannot in fact capture the essence of a moment, but that we can only see the superficial; that truth lies not in a two-dimensional representation of reality, but in the life it tries to portray. A major problem in photojournalism is the concept of objectivity. Since the photographer has to choose from an infinite amount of possible shots, photographs are not “reliable, “exactly repeatable pictorial statements” made by a neutral camera” (Newton, 2001; p. 8), but conscious choices made by the photographer. Newton raises the idea that objectivity is a myth. We can indeed note that the photographer (or whoever is in charge of the reportage) chooses what moment and subject he wants to capture as a representation of the ‘truth’. That image is then selected by the editors and published to show the readers/viewers evidence for a given story. We can then question the old idea that ‘seeing is believing’. Julianne H. Newton indicates that one way of looking at that phrase is that “we tend to see only what we look for. In other words, we believe what we see because we have chosen to see something in a certain way” (Ibid; p. 90). A photograph does therefore not portray the truth, but one view of a specific event, followed by an infinite amount of possible interpretations. Our responsibility towards photojournalism is then to shift our assumptions, as Newton says: “we can shift our assumption that a photograph is true because it looks real to the assumption that what we know from an image is the product of perception” (Ibid; p. 184). The general view of modern photojournalism is shifting from the ‘assumed veracity’ of a picture to a more sceptical and analytical approach. This is not due to the increase and facilitation of photo-manipulation alone, but to the fact that more people doubt the truthfulness of the media in general. According to findings by the Pew Research Center for the People and the Press, “a paltry 29 percent of American adults believe news organizations correctly report the facts. Twenty four years ago, that figure was 55 percent” (Zuppa, 2009). We can hypothesize that what Brian Walski did would have had very little impact on the public’s opinion of the Iraq war coverage had the newspapers not made a scandal out of it. Newton, Julianne Hickerson (2001). The Burden of Visual Truth: The Role of Photojournalism in Mediating Reality, p. 8, p. 45, p. 90, p. 102, p. 177, p. 178, p. 184. New Jersey: Lawrence Erlbaum Associates. [Accessed on 3 November 2009]. Sontag, Susan (1979). On Photography, p. 169, p. 192, p. 206. England: Penguin Books. [Accessed on 5 November 2009]. The war in Iraq has been one of the more controversial wars in recent history since the reasons for it were very questionable. George W. Bush, along with his ‘partner in crime’ Tony Blair, was determined to incriminate Saddam Hussein and invade Iraq to save the world from terrorism. We can hypothesize that the real reason for going to Iraq was to “secure its oil supplies” (O’Shaughnessy, 2004; p. 211), but that is a different matter. Indeed, the task was considerable: to get the public to surrender to, if not accept, two key myths: that Iraq possessed Weapons of Mass Destruction (WMDs) and that there was a close link between Saddam Hussein and Osama Bin Laden. (O’Shaughnessy, 2004; p. 225-226) This was done through assertive headlines, reports loosely based on rumors and assumptions and the extensive worldwide influence of the Fortune 500, “an annual list of the five hundred most profitable U.S. industrial corporations” (New Oxford American Dictionary, 2005-2009). Nicholas D. Kristof from the New York Times mentioned that “the average Fortune 500 company is far more sophisticated at getting its message across abroad than the US government has been” (O’Shaughnessy, 2004; p. 211). Again we come across the idea that power lies where the money is. Finally, the US decided it was time to take action and went ahead with the invasion, while the weapons inspectors were “establishing the fact that there were probably no WMDs in Iraq” (Powell, 2004). Furthermore, “without the backing of the UN Security Council the war was in effect illegal” (O’Shaughnessy, 2004; p. 211). Through propaganda and media influence, this illegal Iraq war could become a reality without too much resistance from the public. Orville Schell, Dean of the Journalism School, comments on the one-dimensionality of embedded journalism: “Getting coverage only from embedded reporters is like looking only into a microscope. What we need is something of the broader picture, and the chance to know other aspects of the whole enterprise” (Powell, 2004). What we get, therefore, is a compartmentalised view of what happens in the war, from a rather centralised source. With the technological advancements of modern media equipment, the public could follow any news from the frontline in quasi-immediacy (with the use, for example, of satellite-linked cameras). Furthermore, since the information and images provided by the embedded journalists had to be shared with other newspapers and news networks (than the journalist’s employer) (O’Shaughnessy, 2004; p. 213), the propaganda system was even more facilitated and increased. It seems that any photographs that benefit the war effort and give it a good name are perfectly acceptable and considered ‘ethical’ even if they don’t portray the truth as well as some pictures considered ‘unethical’ do. Apparently it was discovered, six months into the war, that the US “”heroic welcoming” imagery were mostly photo-ops set up by the military establishment” (Meyer, october 2003). However, that did not create a scandal and no one got fired. The outcome for Brian Walski turned out to be slightly different. The Iraq war has been more than just the most widely reported war, it has also certainly been one of the most propaganda-fueled and media-dependent wars. This could not have been made possible a few decades ago; present society is the perfect cradle for this kind of manipulation. As Maureen Dowd observed in the New York Times on the 9th March 2003: “A culture more besotted with inane reality TV than scary reality is easily misled” (O’Shaughnessy, 2004; p. 225). Nevertheless, how credible does the public actually think news organisations are? With the evolution of photographic tools, does photojournalism remain the most reliable source of information and evidence? Does the saying ‘seeing is believing’ still apply? O’Shaughnessy, Nicholas Jackson (2004). Politics and propaganda, weapons of mass seduction, p. 210, p. 211, p. 212, p. 213, p. 222, p. 225, p. 226. Great Britain: Manchester University Press. [Accessed on 6 November 2009]. Newspapers and news organisations in general are supposed to provide the public with information in a truthful, unbiased and objective manner. This is therefore the responsibility of everyone involved, but the influence on what is finally published is not evenly distributed. Does everyone within a news organisation follow the same agenda? People’s emotions are constantly played with because it is by emotionally stimulating a person that a story/picture is most likely to sell. One enjoys seeing shocking and dramatic pictures because “looking at them suggests and strengthens the feeling that one is exempt” [from calamity]. (Sontag, 1979; p. 168.) The public is generally interested in being emotionally affected by the material looked at, as for news values, they are determined by ideologies, profit and capitalist way of thinking. News become more of a production close to entertainment. Stories and myths are the essence of modern journalism as they give “structure and meaning to the fluid, amorphous events of life”. (O’Shaughnessy, 2004; p. 52.) News therefore use the idea of a hero and a villain to give stories “narrative drive and ethical meaning” (Ibid; p. 133.) This is mainly based on the fact that we feel the need to “blame someone when things go wrong” (Ibid; p. 133.). There is a constant search for a source of evil, even when no villain can be officially identified. The public is therefore manipulated with the omnipresent concept of fear. One of the most obvious examples of this is the media empire of Rupert Murdoch (a fierce supporter of Bush and the Iraq war), which only seems to present the owner’s own political and ideological views, in a very propagandistic way. In a Washington Post article, Frank Van Riper mentions the “jingoism of the coverage [of the Iraq war] by Rupert Murdoch’s Fox news network”, (Van Riper, 2003) probably the least objective news network in Western society. Why is it Murdoch can get away with undeniable ‘unethicality’? Firstly because he owns a very large percentage of the western world’s news organisations, and secondly because his agenda assumedly is the same as the one of the elite at the top of the ‘power pyramid’. In the case of Brian Walski’s composite photograph, as we have seen before, the real issue lies not in the actual photo manipulation. 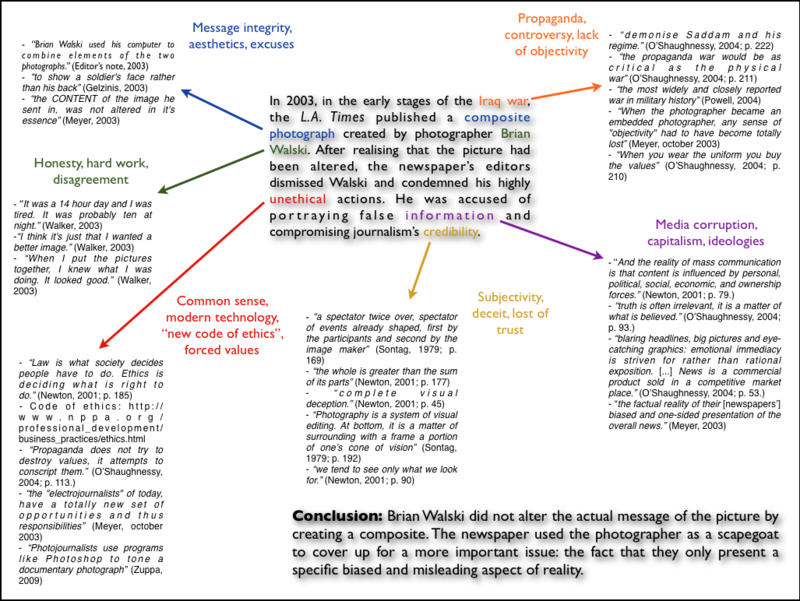 The newspaper’s editors make use of ‘reverse propaganda’ and “by accusing the photographer and attempting to portray themselves as publishing “unmanipulated” news, they are seeking to conceal the factual reality of their biased and one-sided presentation of the overall news.” (Meyer, 2003) In short, they want to gain the reader’s trust by using Walski as a scapegoat for falseness. We could go into the meanings of ‘propaganda’ and analyse the issue more deeply, but we would just deviate further from the original subject matter. How does the Walski scandal fit into the circumstances of the media at the time? What was the relationship between the media and the Iraq war at that point? What was the apparent message of the picture Walski sent in? The picture alone seemingly told us of a soldier giving an order or a warning to one individual or a group of civilians. Put into a specific context (in the newspaper with a title, a caption and a related article), we got a clearer idea of the fact that the British soldier was telling the Iraqi civilians to take cover as the site was under fire. Is that message any different from what the original photograph of the agitated soldier portrayed? The message appears to be untouched. The published picture only looks slightly more visually dramatic, or ‘better’ as Walski said it was intended to be. Photo illustrations may very well be (generally) labeled as such, but it is probably not fallacious to make the assumption that the majority of viewers/readers don’t pay much attention to the label used on a picture, if they even know what the term ‘photo illustration’ means. Why are some photographers ‘ethically’ permitted to enhance their pictures whilst others get dismissed and reprimanded for doing so even when the message stays intact? This happened for example to photographer Patrick Schneider in 2003 for slightly adjusting the colours of a photograph. (See highly recognised photographer Pedro Meyer’s article in defense of Schneider on his ZoneZero website. Meyer, october 2003.) Meyer makes a valid point in questioning the significance of the colours of a picture for a person who is colourblind. Many forms of editing thus don’t impair the message of a photo in any way, and should therefore not be so severly rebuked. Photojournalists need to be truthful of course, but this applies to any form of journalism, just as much to writers as to photographers, as well as to the relation between the two. Photographs in newspapers are generally linked to an article, or at least captioned, often by someone other than the photographer. This can very easily impair the integrity of the photographic message, either accidentally or intentionally. We therefore get information (or disinformation) about the same event from two separate perspectives, with potentially two distinct intentions or agendas. A picture put in a different context (or outright taken out of context) is a completely different picture, presenting a different set of information, and is therefore no longer faithful to the original message. We can argue that ultimately the only thing that matters is that the truthfulness of the event is rendered. The responsibility lies therefore not so much in the hands of the photographer, but in those of the picture editors, journalists, news editors and anyone else substantially involved in news organisations and media conglomerates. News and media institutions seem to use this misguided code of ethics as a permission slip, as a justification, to manipulate information, events and the public opinion to their advantage and for the benefit of the powers that be. How do these organisations operate? How accurate and objective are the ‘news’ we are supposedly truthfully reported? Thus, photojournalists have a duty to portray situations accurately, as clearly as possible, no matter the artistic quality of the picture. That is the main difference between an art photographer and a news photographer. To report clearly what they see. To be fair, accurate, and honest. On their website there is a page devoted to a Code of Ethics for photojournalism. This brings up the question: Did Walski alter the message of the photographs by putting them together? Did his creation misrepresent the situation captured? Brian Walski’s dismissal was not in accordance with any laws. There are no laws concerning photojournalism, only ethics. The photographer’s redundancy was completely up to the L.A. Times, it was at their discretion alone. Again we can ask ourselves: was the outcome reasonably justifiable? Did the Times have an ulterior motive? Newton, Julianne Hickerson (2001). The Burden of Visual Truth: The Role of Photojournalism in Mediating Reality, p. 5, p. 185. New Jersey: Lawrence Erlbaum Associates. [Accessed on 3 November 2009].